ME-GI Engines for World’s and scantling draught of 12.30 m.
JHW ordered ? ve 85,000 cu. m. Very have already been secured. Heavy Industries (HHI) will build the ilarly-sized vessels with conventional requirements with the aid of MAN Die- tem. MAN Diesel & Turbo is also pro- engines in Korea. Delivery of the ? rst viding each vessel’s shaft-alternator tanks, reducing shipping costs through carrier is scheduled for the middle of sel & Turbo’s EGR (Exhaust Gas Recir- greater economies of scale. culation) technique. They will feature an system. Upon construction, the vessels 2017. Captain Ulrich Adami, Fleet Man- MAN Diesel & Turbo said it sees sig- ager of Hartmann Schiffahrts GmbH injection pressure of 400 bar and form will be the largest ethane carriers ever ni? cant opportunities arising for gas- & Co. KG, said, “The ME-GI engine the main part of a propulsion system that constructed. MAN Diesel & Turbo also fueled tonnage as fuel prices rise and reports that it currently has eight ethane modern exhaust-emission limits tighten. appealed to us for several reasons, not also features a MAN Diesel & Turbo Al- least its environmental credentials with pha controllable pitch propeller. engines on order. Indeed, research indicates that the ME- negligible slip of gas fuel, and its robust, The ME-GI engines will drive The newbuild ethane carriers form the GI engine delivers signi? cant reduc- stable combustion properties – even in VBS1810 propellers, which are the basis for United Ethane Carriers, a new tions in CO2, NOx and SOx emissions. largest Mk 5 models (diameter 7.6 m) ethane venture that the Hartmann Group heavy seas. We also viewed its high fuel Furthermore, the ME-GI engine has no ef? ciency and its ? exibility of being able ordered from MAN Diesel & Turbo’s is developing with Jaccar Holdings of methane slip. 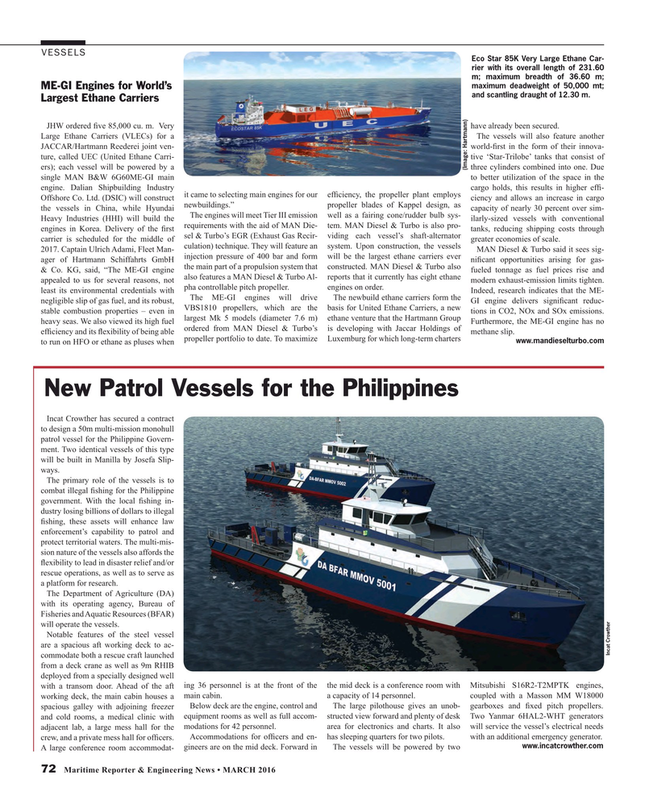 Incat Crowther has secured a contract to design a 50m multi-mission monohull patrol vessel for the Philippine Govern- ment. Two identical vessels of this type will be built in Manilla by Josefa Slip- ways. The primary role of the vessels is to combat illegal ? shing for the Philippine government. With the local ? shing in- dustry losing billions of dollars to illegal ? shing, these assets will enhance law enforcement’s capability to patrol and protect territorial waters. The multi-mis- sion nature of the vessels also affords the ? exibility to lead in disaster relief and/or rescue operations, as well as to serve as a platform for research. Fisheries and Aquatic Resources (BFAR) will operate the vessels. Incat Crowther commodate both a rescue craft launched from a deck crane as well as 9m RHIB deployed from a specially designed well with a transom door. Ahead of the aft ing 36 personnel is at the front of the the mid deck is a conference room with Mitsubishi S16R2-T2MPTK engines, working deck, the main cabin houses a main cabin. a capacity of 14 personnel. coupled with a Masson MM W18000 spacious galley with adjoining freezer Below deck are the engine, control and The large pilothouse gives an unob- gearboxes and ? xed pitch propellers. and cold rooms, a medical clinic with equipment rooms as well as full accom- structed view forward and plenty of desk Two Yanmar 6HAL2-WHT generators adjacent lab, a large mess hall for the modations for 42 personnel. area for electronics and charts. It also will service the vessel’s electrical needs crew, and a private mess hall for of? cers. Accommodations for of? cers and en- has sleeping quarters for two pilots. with an additional emergency generator.